“Brinware is what happens when you combine the care and concern of a parent with the creativity and passion of an artist. In 2009, with mounting concerns over the toxic materials in children’s products, we began to discuss ways to be part of the solution. We knew we wanted to take the fear and concern out of picking the right things for your kids. But we wanted to be careful not to take the fun out of such a short, magical time of life. This led us to launch Brinware. I recently had the opportunity to review a variety of children’s plates and placemats by Brinware. 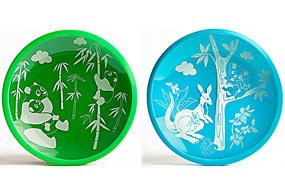 Mind you, these are not your average plates and placemats. Brinware plates are made of glass and come with a protective silicone sleeve so that they won’t slide around. 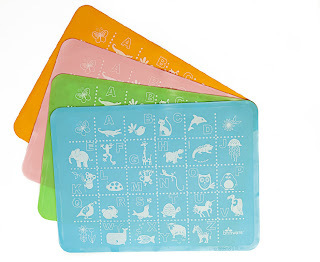 The placemats are made of food-grade silicone, and have a really cute alphabet design on them. 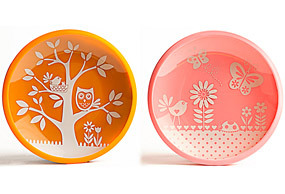 Brinware plates are made of the finest materials we could find. They feature durable, strong tempered glass and come with a removable silicone sleeve for added protection and slip resistance. They are safe, durable and fun. Brinware Placemats are made of food grade silicone and are a great addition to the Brinware Plate set. Each placement is easy to clean, won’t retain odors and easily rolls up so it is good for home or on-the-go. My son absolutely loved the plates and placemats, and asks to use them every single day. Of course, he loves them for the cool designs on them, and care nothing about the functionality, so let me tell you what Mom thinks! I also love these plates!! Yes, the designs are really great and I love that each time we lay out his placemat, my son immediately starts to recite his ABC’s and what each letter stands for, but I love these products most for their functionality. I really like how the silicone doesn’t allow the plate to slide around and possibly cause that big “uh-oh” moment, when your child’s plate tips over or falls off the table during dinner. Another thing that I really like about these plates is that they are microwave and dishwasher safe. As a Mom on the go, that is very important to me! BUY IT! You can purchase your own Brinware products at www.brinware.com. Be sure to enter promotional code MC20 for 20% off of your purchase!